PTG refers to the strengths people have, or can develop, as a consequence of being exposed to trauma. 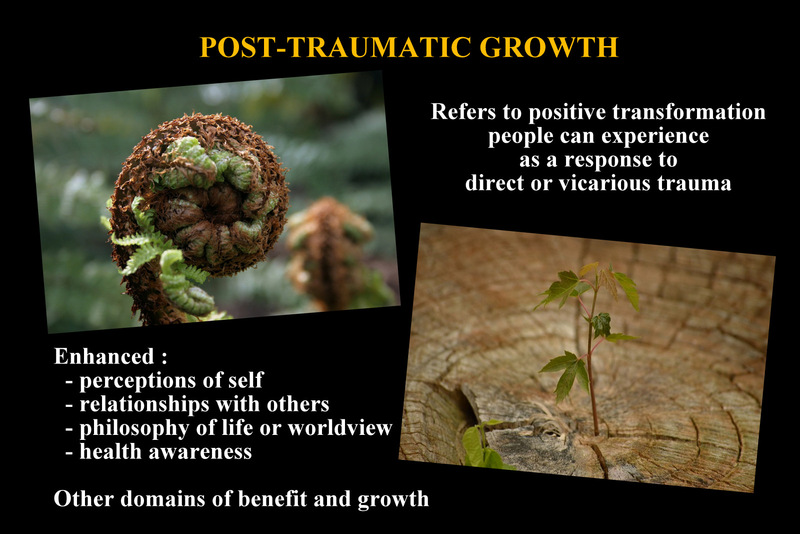 Informally, post-traumatic growth (PTG) refers to the personal growth people frequently report in the aftermath of traumatic experience. This often unanticipated change can be one of the many responses to trauma that a person may experience. Formally, research has shown that people commonly report positive transformations following the experience of trauma (as evidenced by Tedeschi and Calhoun (1995)). PTG can transform people’s sense of self, relationships with others, and appreciation of life, while providing new opportunities and fostering spiritual growth. Tedeschi, R., & Calhoun, C. (1995). Trauma and transformation: Growing in the aftermath of suffering. London: SAGE Publications. To learn more, listen to this podcast featuring Rhonda Abotomey and Louise Harms. the trauma paradox of simultaneous growth and decline.